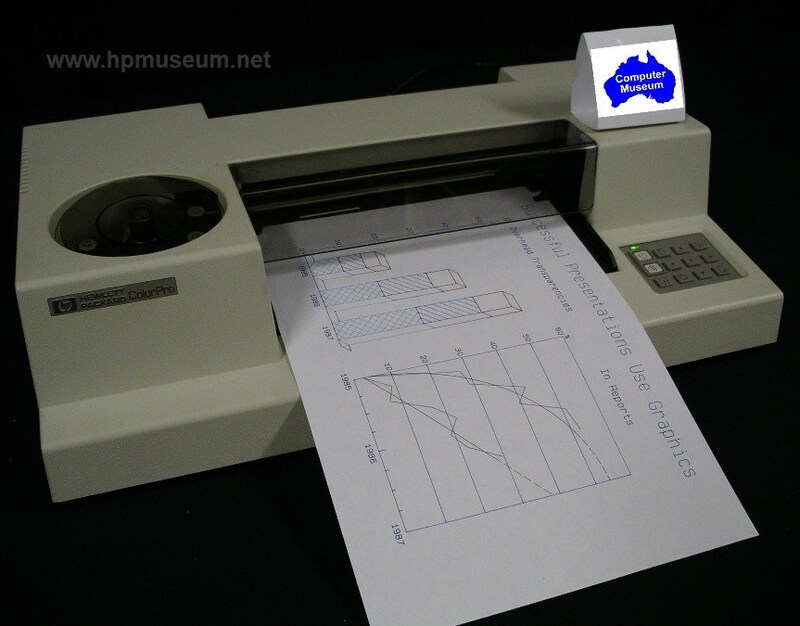 The ColorPro was the only HP small plotter to have a name, rather than just a number. It was code named "Joey" to partner with an HP computer code named "Kangaroo". The ColorPro offered Serial or HP-IB interfaces. It came with a minimal built-in set of HP-GL commands which were expandable via a plug-in ROM or GEC (Graphics Enhancement Cartridge). The ColorPro was meant to be the colour output device for business professionals. Although it only plotted on A/A4 media, it had 8 pens and was priced a third less than the successful 7475. However, the product achieved unit sales levels less than half those of the 7475. Click here to view a 12 second video of the ColorPro in action (1.9 MB). The ColorPro created some inventory management problems for the San Diego Division shortly after the product was introduced. The ColorPro had originally been conceived as a low-cost color output device for general purpose business graphics users. Up until a few months before introduction, the division was considering price points as low as $695 for the new product. 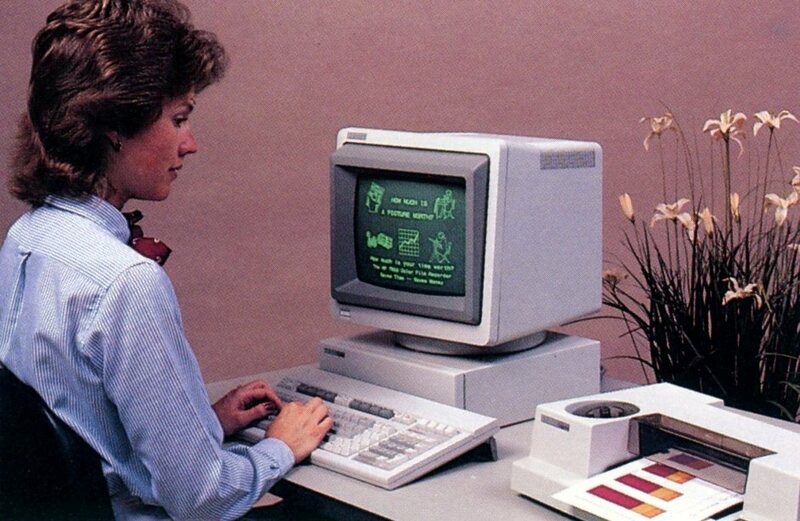 Given the exploding use of business graphics in the PC marketplace, unit forecasts for the ColorPro were high. However, extensive market research on pricing showed that potential users were not particularly price sensitive. More customers would by the product at $695 than at $1295, but not twice as many (in fact, nowhere near twice as many). To maximise profitability, the division introduced the product at a price of $1295. Unit sales of the ColorPro were well below expectations and well below what had been planned for. The manufacturing department had geared up to produce large volumes that did not eventuate. A lot of finished goods piled up and were stored in rented trailers on the division's site. Some joked that the division's JIT (just in time) inventory management philosophy really stood for "Jam It Into Trailers". In the meantime, sales of the 7475A continued at almost the same pace after the ColorPro as they did before the ColorPro. SDD had expected the ColorPro to cause a sixty to eighty percent drop in sales of the 7475A. The division was able to keep the price of the 7475A at $1895 (the original plan called for a reduction to $1495 or $1595), and continued to make a lot of money out of that cash cow. Naturally, inventory of the 7475A became scarce as SDD had planned for a significant drop in volume. HP had intended to obsolete the 7470A at the introduction of the ColorPro. After all, the 7470A had only two pens compared to eight on the ColorPro. The only thing the 7470A could offer that the ColorPro didn't match was an optional HP-IL interface (which accounted for less than four percent of sales). Because the ColorPro was introduced at the high end of the studied price range, SDD decided to continue the 7470A and reduce its price to $1095. The ColorPro did eventually take about fifty percent of the volume of 7470A sales.